This post is designed to drive with a rental vehicle. Therefore, if you are still planning your trip and want to rent a vehicle, here you can find different options at best prices. We recommend opting for a 4×4 since, if you want to explore as much as possible, you may have to drive through tedious gravel roads. Both, rental vehicles and accommodation prices increase during the summer season. We assume you will start from Reykjavík. If so, take the number 1 road to the north and then the 60. This one will take you to the south part of the Westjords. This area will seem more remote than the others because you will hardly find a town. Yes, you will find 3 gas stations to refuel, but forget to see people around. If I had to describe this area, I would say that it stands out for its dirt roads with steep slopes and an impressive landscape that combines mountains and sea. Also, a constant feeling of being far away from civilization. Gufudalur route (4m). This small route follows a small river with several waterfalls and impressive views of the fjord that improve as you go up. Find more hiking experiences in this post: Where to hike in Iceland? Flókalundur swimming pool by the sea. It is located on the left of the road. You will have to park your car in a small dirt parking lot and go down on foot. Here you can enjoy wonderful views of the sea and the fjord. Stunning views everywhere. The southern road crosses the mountains above leaving impressive views. Do not hesitate to park the car in authorized areas and contemplate the landscape. Rauðasandur is a beach of reddish-orange sand located between mountains with water sea streams getting in. It is much more beautiful when it’s sunny and even more at sunsets. The road to reach this wonderful beach is a somewhat steep gravel road. Pay attention and drive carefully. 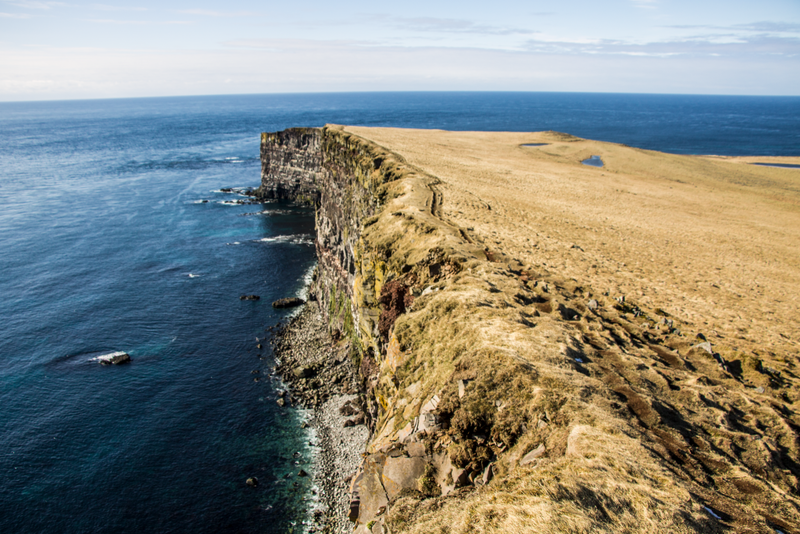 Látrabjarg is one of the largest seabird cliffs in Iceland. With 14 km long and heights of up to 441m impresses everyone that goes there. This is one of the favorite places of the well-known puffins come to these cliffs to lay eggs. If you approach carefully the edge of the cliffs you will see them. But be very careful when approaching the cliffs as it is usually very windy. Patreksfjordur: this town is one of the “biggest” (660 inhabitants) of the south-west part of the Westfjords. Here we recommend going to Patreksfjordur Swiming pool that will surprise you with stunning views of the entire fjord. Before getting to this town you must make a stop at the stranded ship next to the fjord. Called Garðar BA 64, it is the oldest metal ship in Iceland and picturesque enough to spend time gazing its beauty and taking some pictures. Dynjandi Waterfall is impressive. You can get super close and feel its power. Dynjandi: this impressive waterfall with 6 falls is located above of an abandoned farm. 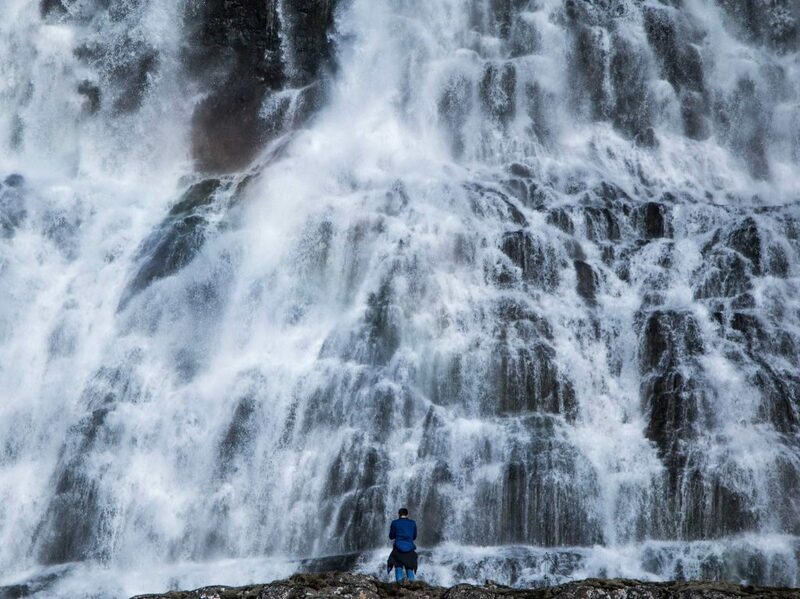 You can walk by all these falls on foot and approach the largest and most impressive, Fjallfoss, with a height of 100 meters and very broad. The views from this point are impressive: the mountains of the fjord, the other falls of the waterfall and the passage of the sea between the mountains. 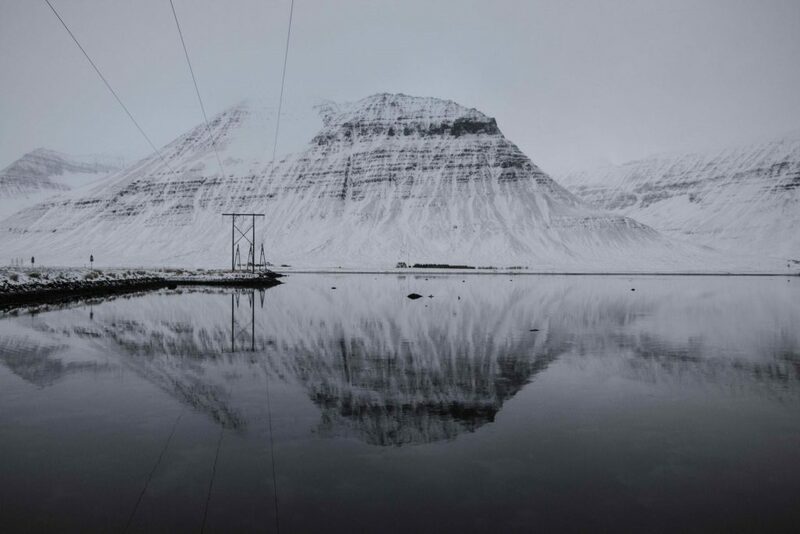 Stunning reflection in the northern part of the Westfjords. Taken in Winter. Stop at Onundafjorður and gaze the impressive landscape surrounded by mountains. Here you will find a yellow sand beach that is worth seeing. Eat at Tjoruhusið: it is located in the harbour of Isafjordur. It does not have a sign that says its name so you have to recognize it by its red color. Here you will taste the best fish in Iceland: everything homemade, all-you-can-eat and cheap. Could not be better! We recommend you book in advance. Visit the Arctic Fox Center in Sudavik. Here you will have the opportunity to see the arctic foxes up close. Stop at a place called Lítill Bær to eat homemade waffles and coffee. This little black house is next to the fjord road where there are usually seals next to some rocks on the surface of the sea. Take a bath by the sea in Drangsnes. It is about three small hot pools by the sea where you can relax and enjoy great views. Visit Djúpavík, one of the most remote villages in Iceland. Here lives a family that owns and runs the only hotel in the village. There you can eat something and visit the old abandoned factory of fish oil where a scene from the Justice League was filmed. Djúpavík is on of the most remote villages in the Westfjords. In this post, we have pointed out specific places, but you should bear in mind that the beauty of the Westfjords is simply the Westfjords. Our greatest advice is: Do not ignore the landscape and enjoy everything you see. Remember to stop in the authorized areas and drive carefully!